Here at Perfect Profiles, we take pride in helping our patients to restore their smile, and with it their confidence. 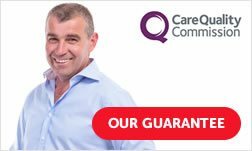 We are always looking for new treatments to help people feel better about their teeth and get more out of life as a result – and our latest offering ‘Perfect on 4’ promises to help those who are unhappy with their dentures. What is Perfect on 4? Our brand new ‘Perfect on 4’ treatment is our lowest cost offering for a fixed solution to replace an entire arch/row of teeth. 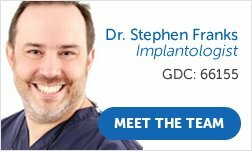 It is a proven and attractively priced alternative to common solutions such as removable dentures, implant retained dentures or fixed bridges. Although dentures are a very common solution for patients who are missing an entire arch or row of teeth, there can be some drawbacks. Some people find that they just can’t get used to wearing dentures, whilst others find that wearing dentures can restrict their diet, make them feel uncomfortable eating out or in groups and also make them feel old before their time. They can also become very loose and rub on the gums, creating soreness. Luckily, the Perfect on 4 treatment offers a chance to say goodbye to such problems and enjoy a fresh start. For those people unable to get used to dentures or removable plates, we are now able to place a complete row of teeth held securely by just 4 dental implants. 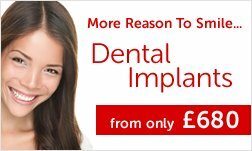 The teeth and gum line are replaced in the form of an acrylic bridge of teeth fixed onto the implants, creating a long lasting solution that will function just like natural teeth without the fear of them moving or falling out. Research has shown that people who are unhappy with their dentures do not enjoy eating. As well as having an impact on diet, this can also have a significant effect their social lives. With Perfect on 4, you can fall in love with eating again. 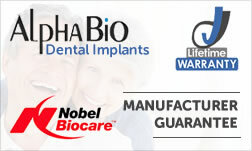 The dental implants within the gum line mean that a daily glue/paste to secure your denture is no longer required and even better, your taste and eating will become significantly improved. Thanks to the more secure biting and chewing function this treatment will bring, eating can once again become an enjoyable part of the day rather than one that may cause anxiety or lead to frustration at the restricted list of foods you can eat. There is no large traditional denture plastic covering the upper or lower of the mouth, so no more interference with your eating. As a result, you can return to enjoying meals in general and look forward to comfortable and pleasant experiences eating out with friends and family, as well as a better ability to be able to fully taste your food. We are very pleased to offer all of this for just £8495! * We also have an attractive 0% APR finance option available to help with payments, meaning a new start could be waiting for you sooner than you thought. 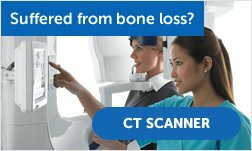 Your complete treatment options and costs will be confirmed upfront and entirely free at an initial consultation. 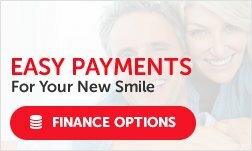 There is no obligation to proceed so it’s a great way to find out your dental options without any commitment or payment necessary! 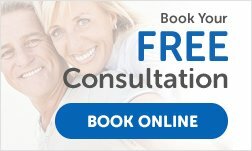 To book your consultation or request more information about ‘Perfect on 4’, call us today on Luton 01582 518 100 or Wolverhampton 01902 500 823. 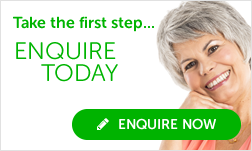 Alternatively, click to receive a brochure or request a call back. *Prices correct at time of publication. Please call us to confirm the current price.